- Known issue: raid quests get delisted when 5 players are in the group. This is due to a change in 7.2.5 and it's not caused by WQGF. - The hotkey now also removes the invite confirmation. No more clicking! - Back from my holidays, time to work again! - More UI changes coming in the next few days, stay tuned! - Updated localizations. Thanks again to the translators! - It is now possible to bind the WQGF button (Key Bindings > AddOns > WorldQuestGroupFinder). Submitted by vincentSDSH, thanks! - Trying to comply with the new UI restrictions. Guaranteed with 99% less automation! - This is a very early prototype, expect bugs! - Known issue : There seems to be some occasionnal taint errors since the 7.2 patch. I'm currently investigating this and will release a fix as soon as possible. - The groups browser can now be called by right clicking on the button, and no longer by clicking with CTRL pressed. - Updated for 7.1.5, overloading the new in-game WQ group search with all the WQGF features you love! - WQGF now displays the blizzard find group button on every compatible quest / world quest. Clicking it will start searching for a group. Clicking it with CTRL down will call the built-in group finding function. - It is time to remove support for left clicking on the quest tracker :) Use the middle button now! - Removed location restrictions to search for a WQ as it was causing issues to some users. Please don't abuse this! - Improved realm type detection for the "Avoid PvP servers" option. WQGF will no longer use the group author's realm to determine is a group is on a PvP realm. Instead, it now check the player's PvP flag which can almost everytime say if he is currently phased on a PvP realm or not. Additionally, the group's realm type flag is now refreshed if for some reason the group switches to another type of realm. - Raid mode is now allowed for this week's world boss WQ. - Internal code rework for localizations. - Now translated into Spanish by Ooka (EU-DunModr)! - WoW Auto-Invite is now forced to disabled while doing a World Quest. Who wants realm hopppers? - Now translated into German by Bullsei! - A button has been added on the WQ tracking to search for a new group for the current WQ. This button is replacing the same action in the right click menu. - It is now possible to search/create a group by clicking on a world quest in the objective tracker with the middle mouse button, as the default behavior of left clicking on a world quest in the objective tracker is to open the map. - Added a new option to automatically leave the group after completed a world quest. There's a 10 second delay so you can still choose to stay if you want to. - Now translated into Russian by Минтерм (EU-Soulflayer)! Thank you! - Raid mode warning will no longer appear when joining a raid group for a WQ that can be completed while in a raid. - The "Use WoW's auto-invite" option has been removed. - Added this week's world boss WQ to the list of WQs that can be completed while in a raid. - Changed the way the addon detects the player entering a WQ area, which should hopefully improve compatibility with other addons and remove the need for the WQ objective tracker to be visible. 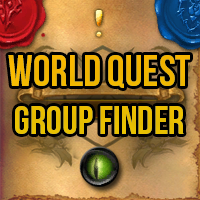 - Is it now possible to search for another group (or create a new one if no other is available) by right clicking on the world quest tracking. - The group search will no longer use the language filters selected in the group finder interface. All languages are now automatically selected. An option to keep the previous behavior has been added in the addon's configuration window. - The group creation loop bug should be fixed. - "World quest completed" message added in 0.10.1 will no longer appear when debug is disabled, sorry! - Added a list of world quests that are completable in raid mode. These will no longer be restricted to party mode and 5 players. The list will be filled over time when I test the WQs in raid mode. If you know some WQs that work in raid mode let me know their IDs! - Reverted previous change for elite quests. Looks like some of them aren't eligible for raid groups. - Group leader won't broadcast that the group is no longer doing the current world quest anymore when he completes it. - Added Portuguese translation by Lobeom. Thanks! - Fixed the broken dialogs, sorry! - Added a custom auto-invite function which will automatically invite group applicants, prioritizing WQGF users. It will stop auto inviting when the group is full (and won't ask to switch to raid mode). Also, it should reduce the amount of realm hoppers encountered as the group is not listed as an "auto-invitation group". - It is still possible to choose use the default WoW auto-invite function in the addon's options. Choosing this will override the custom auto-invite function. - WQGF will now try to switch the group back to party mode if for whatever reason it is in raid mode. - Group applications will now be canceled after 45 seconds if no answer is given. WQGF will then try to find another group or will create your own. - All parameters are now account wide. As a result of this, your current parameters will be reset. - Removed a leftover debug print from the code, sorry! - It is now possible to find/create a group by right clicking on a quest in the objective tracker as the option has been added to the contextual menu. - WQGF will now ask the player if he wants to find a group when entering a new world quest zone. It is also possible to enable automatic group finding when entering a world quest zone. This is configurable in the addon's settings. - It is no longer possible to find/create groups for pet battle and dungeon world quests.